Dr Chris Hart and his team pride themselves on delivering the highest quality treatments, complemented by exceptional service and care. Each patient is treated as an individual, with treatments tailored to suit your specific condition. Choose Dr Chris Hart to ensure you receive the highest level of expertise and the right advice. We are proud to be a QIP Accredited Practice. This means our practice and staff are committed to continuously improving the safety and quality of care we provide. Dr. Chris Hart also carefully addresses dental needs by providing comprehensive treatment plans for patients with missing teeth, missing tooth structures (tooth restoration), dental trauma and cosmetic dental needs. If second opinions on treatment plans are needed, Dr Chris Hart readily offers practical and cost-effective solutions for patients to consider. 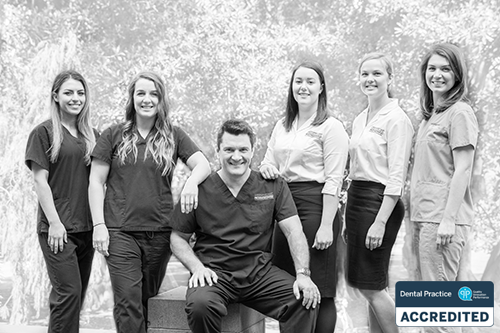 Our experienced team always take the time to listen to what you want for your new smile, to answer your questions, and to ease any anxieties or concerns you may have. Because to us, you aren’t just a number. Prosthodontics is a specialist area of dentistry which deals with dental prosthetics or prosthetic dentistry. It is primarily focussed on the repair or restoration of damaged or missing teeth. A prosthodontist must first become a qualified and practiced general dentist, before completing further specialist studies in prosthodontics. This ensures they have a solid understanding of the mouth, as well as practical experience in all areas of general dentistry. 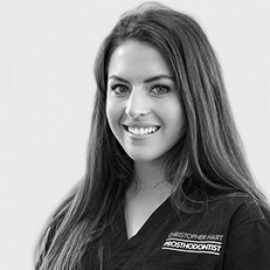 Prosthodontists are highly-trained specialists with a unique skill set and understanding of all the elements which go into a natural, functional and beautiful smile. This doesn’t just include the teeth, but also extends to the gums, lips, and facial features to create harmonious aesthetics and to restore working ability. Their primary role is to comprehensively plan and perform complex procedures which see the replacement or reconstruction of natural teeth with biocompatible substitutes. 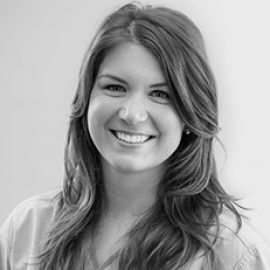 In choosing a prosthodontist, you may be sure your mouth is receiving the most efficient, qualified and experienced care in relation to prosthetic dentistry. 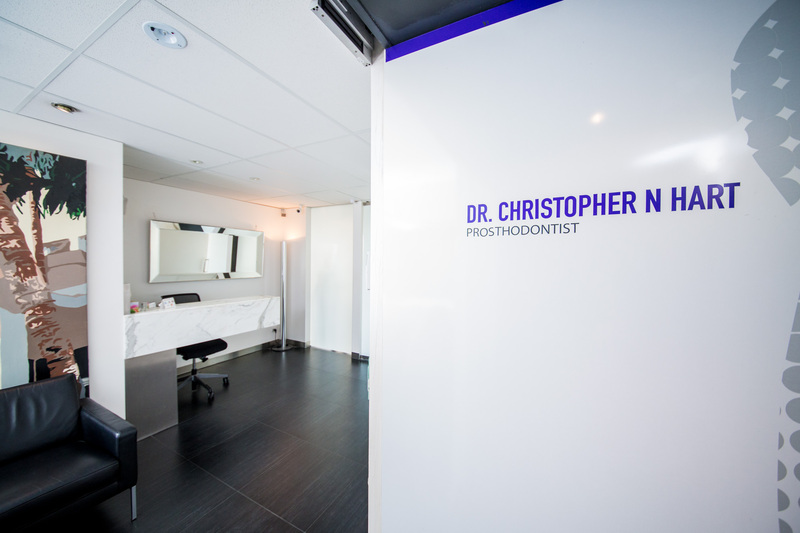 Dr. Chris Hart is passionate about finding innovative and effective solutions for his patients and is widely recognised as an innovator and leader in his profession. He received a Bachelor of Dental Science from the University of Melbourne in 1994, before gaining general dentistry experience across Australia. In doing so, he established a strong foundation on which to build and continue his specialised studies. In 2001, he returned to the University of Melbourne to complete a Master of Dental Science. 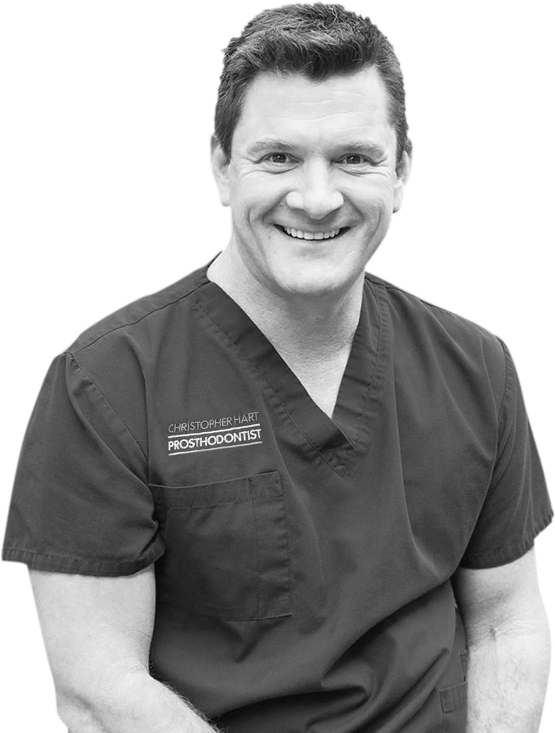 From 2004 to 2006, Dr. Hart was selected to be a part of the International team for Implantology Scholars and worked in the Department of Surgery at the University of Berne in Switzerland. 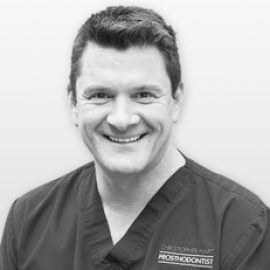 As well as working in his Melbourne clinic, Dr. Chris Hart regularly gives lectures, seminars and information evenings both for other professionals in the field and for patients considering prosthodontic treatments. His passion for his craft has encouraged him to design and develop dental and maxillofacial prosthetics, helping to restore function and aesthetic to his patients, with genuine care and dedication. In 2007, Dr. Chris Hart opened the doors of his first practice and finally realised his long-term dream. Since then, he has extended his services to a practice in Bendigo, and has helped to restore function and aesthetic to hundreds of smiles. Enter the doors of the Collins Street clinic and you will be greeted by a luxurious, comfortable and relaxed waiting room, where our friendly staff can help to guide you through your treatment process. Our rooms not only offer state-of-the-art equipment, they are also spacious, spotless and boast stunning views across Melbourne. Dr. Chris Hart Prosthodontist also has its very own in-house ceramic and acrylic laboratory, which allows Dr. Hart to work closely with our technicians using cutting-edge digital technology to ensure our work is functional and aesthetically pleasing. Creating a beautiful and functional smile cannot be done by one person alone; it requires the collaborative effort of several qualified and experienced professionals and is at the heart of what we do to ensure the best possible results. Our collaborative digital workflow not only means more accurate planning and treatment, it also means high-tech materials and faster turnaround. Currently, we are the only dental clinic with in-house industrial CADCAM capabilities, meaning we can generate parts for any implants system, including same-day replacement for All-On-Four dentures and same-day construction of implant teeth. So you can achieve the smile you want sooner. Our practice is located in the Coates Building at the Spring Street end of Collins Street. This is a short walk from Parliament Train Station, and immediately in front of the 11, 42, 48, 109, 112 trams (stop 8). 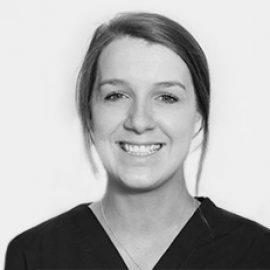 Dr Hart provides prosthodontic expertise through his practice in Bendigo, seeing local patients as well as those from Shepparton, Echuca, Castlemaine, and other regional locations. To get in touch with one of our friendly team members, please fill out the form below.